This week has been such a toughie! Firstly Neo having gastroenteritis, then i had a 2 day Sage accountancy course and exam which left my brain completely and utterly frazzled!! I came out of it yesterday and i was completely spaced out. I’ve had a week of very little sleep ( i do not exam well, i stress i worry and generally work myself up!) So i am happy to see the weekend of this very stressful week. I’m just in the middle of packing up again to go to the in-laws in London again (we were supposed to go last week but Neo being poorly obviously put those plans on hold) So this weekend i am having a complete break. I am taking no hair products, very little make up, one pair of jeans and 2 jumpers.. that is all!! I’m gunna have a break from outfits and just slum it! Do you ever feel like doing that? No thinking involved, just throwing on jeans and a jumper? My hair will have a rest from products and my face can breathe freely. I gotta say, i’m looking forward to it. And i’m also looking forward to coming back Next week with lots and lots of fun outfits totally refreshed and re-inspired. I’ve just received a lovely Cath kidston Skirt and if we’re friends on Instagram/ twitter (im Rachelthehat on instagram, which i now love!! let me know your’s too so i can follow, or twitter @rachelthehat) then you will see i also just added a beautiful pair of Irregular Choice shoes to the collection.. Can’t wait to show you those! I’ve made over £85 on ebay lately selling stuff from my clear out, so i’ve been happily doing a bit of guilt free online shopping.. Oh yes!! Its amazing!! 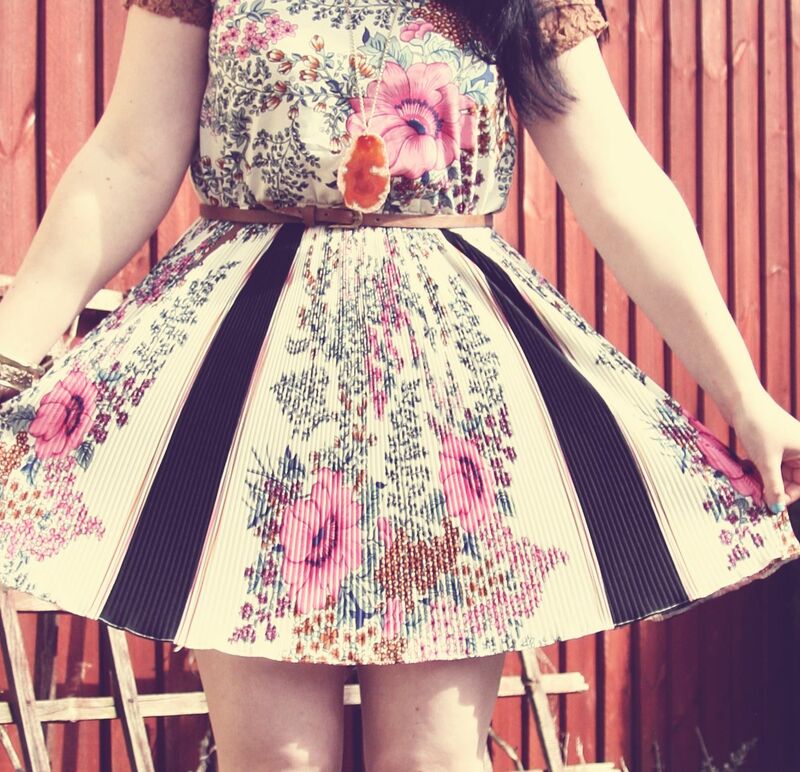 So i will love you and leave you with some pics from the guest post i did recently for Lauren Ella. It was when we had the beautiful weekend… Oh wouldn’t it be nice to have that sun and warmth back!! Have lovely weekends all and i can’t wait to catch up with all of you on Monday! Oh I LOVE the necklace and the print on the skirt! I am so with you with going free style sometimes and not get ready at all. I need that so much sometimes to get through life. No thinking is a terrific way of being. Have a wonderful weekend! This dress is lovely! I love the colours on it. Love this dress, you stylish gal you! lovely dress, rachel. and your shoes are perfect. i love me a good t-strap heel. your weekend sounds like it will be wonderful – nice and low maintenance. we all can use that from time to time. have a great time!! Ooh what a fab dress! What a week you had, hope the weekend is alot easier on you! Sounds like a really nice break, I'm similar this weekend as I'm going camping, but it's with a lot of people so I still like to festival-glam it with inapropriate dresses! Just less hair-care and more hoodies!